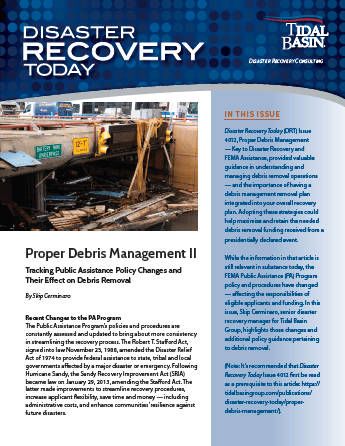 We are pleased to share with you our brand new edition of Disaster Recovery Today entitled “Proper Debris Management II – Tracking Public Assistance Policy Changes and Their Effect on Debris Removal,” authored by our Project Manager, Skip Cerminaro. Building on a previous edition of Disaster Recovery Today, Mr. Cerminaro discusses recent changes to the FEMA Public Assistance (PA) Program and its effects on eligible applicants and funding. He also stresses the importance of having a debris management removal plan in place and integrated into your overall recovery plan. To read the full article online, click here. To access the full library of Disaster Recovery Today articles, click here.